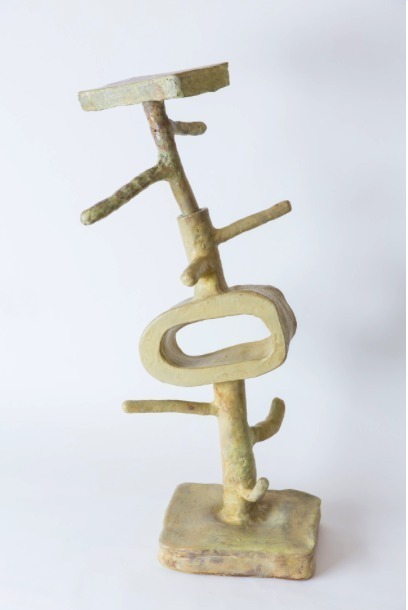 This engagingly titled show, “Knocked Kneed and Bow Legged,” pairs Matt Kleeberg’s paintings and Woody De Othello’s ceramic sculptures. Both examine the cultural moment’s unsettling instabilities — the gallery press release’s “curious alternate realities within unsettling social climates” — with beauty and humor. Kleeberg’s large oil and paintstick canvases have the bright palette of 1960s hard-edge abstraction, but none of its dogmatic insistence on flatness, materiality and literal interpretation. 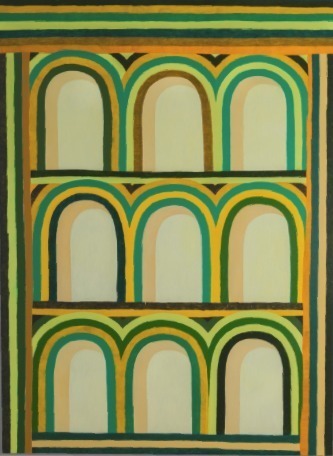 Indeed, they play with the old metaphor of painted space as a virtual world framed by the painting’s edges, with their arched doorways, arcades, and doorlike niches, all walled up, so to speak, without exterior views. They are framed here and there by colored stripes and faux swatches of deckle-edged torn paper. Two of the paintings ("Sanctionary Sanctuary" and "Bike Sock Shock Jock") cheerfully take the isometric perspective used in architectural rendering and squeeze it almost flat. Notice also Kleeberg’s humorous titles, including the likes of "Dancin’ Dave Dickel (Bad Hombre)" and "Fire and Brownstone." The recent flap over the Whitney Museum Biennial’s inclusion of a semi-abstract painting of Emmitt Till—the young black boy murdered and mutilated by southern racists—shows what a tangled web artists and viewers negotiate with inflammatory material like American race relations. 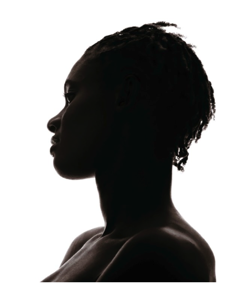 Black artists seem to be able to explore the theme, understandably, with more discrimination, than some white artists, who can easily be accused of ideological carpetbagging, scandal being one of the major options in the careerist’s toolkit, as the controversies of the 1980s prove. Two Venezuelan artists are showing their individual paintings, plus works done in collaboration. 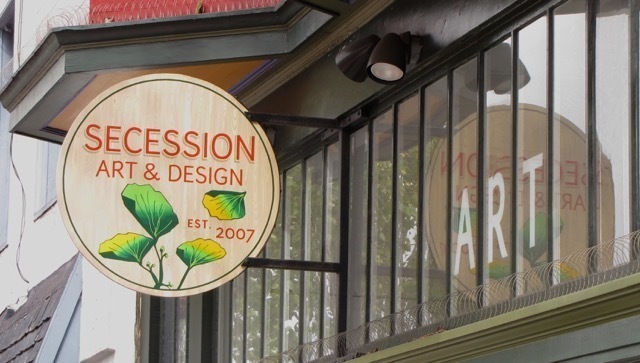 at Secession Art & Design, 3235 Mission Street (not far from Cesar Chavez), San Francisco. We in the art world are accustomed to consider artmaking primarily a solitary activity, and artwork as reflecting a single sensibility. In general, that is the case, so we normally scant the idea of artistic collaborations. In the Renaissance, painters learned their craft in workshops headed by master artists. Remember, for example, Andrea del Verrocchio’s Baptism of Christ (1470-5 or so), with its radiant angel, the contribution of a young Leonardo da Vinci. The creative marriage —or mountain-climbing expedition, depending on which metaphor you find more striking—of Picasso and Georges Braque during the early years of Analytic Cubism is another creative collaboration, producing paintings that, although painted separately, were indistinguishable even to their creators. Picasso also maintained a serious rivalry with Matisse, each painter challenging the other—as Leonardo, Michelangelo and Raphael had, five centuries earlier: collaboration as parallel evolution. 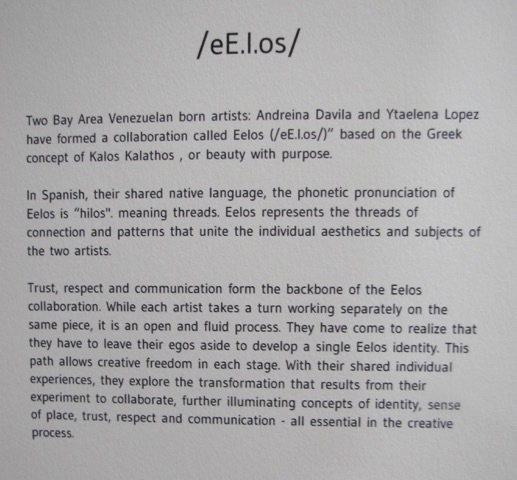 The Venezuelan painters Andreina Davila and Ytaelena Lopez, who met in the Bay Area, entered, in February, 2015, into an artistic partnership, entitled /eE.l.os/. The word, a typographical variation of hilos, threads in Spanish, reflects their interest in the question of identity and its malleable relationship to place, natural concerns to immigrants in this multicultural time in this diverse place. The threads also serve, according to the artists’ joint statement, as connectors between people and nature, bridging realms usually considered separate; in visual terms, they connect and unify Lopez’s portraits and animals and Davila’s painterly abstractions, synthesizing drawing and color, opposing aesthetic camps in the early nineteenth century painting, but now, in the twenty-first century, partners. 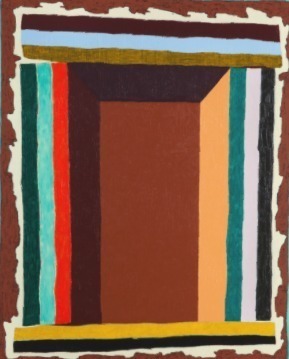 While the paintings, which the artists pass back and forth, sometimes over long periods, have resemblances to their individual works, it’s clear that the partnership creates, in effect, a third artist, and that this tertiary work feeds their solo works as much as they in turn nourish /eE.l.os/. I see the innocent animals of /eE.l.os/ as performing a similar service for our endangered and not-so-innocent anthropogenic era. If this sounds overly serious to viewers who resist what George Grosz called Tendenzkunst, tendentious art, or sociopolitical art, the works, like Marc’s and unlike Grosz’s, are visually complex and surprising, and quite beautiful. 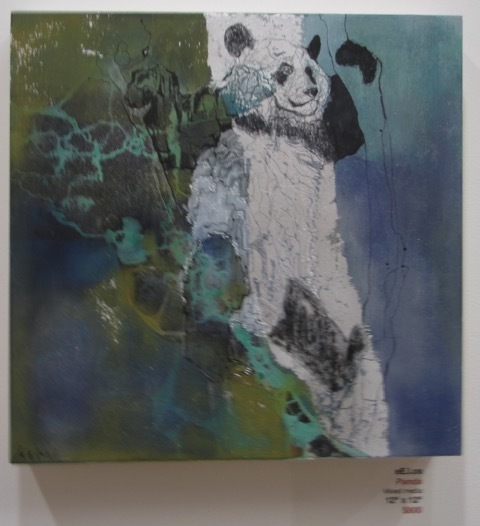 Ytaelena Lopez’s stylized, semi-abstract backgrounds—large patches of pure color modulated by tones and organic textures to suggest natural habitats, phenomena and processes—offer aesthetic delight and even mystical transport that transcend the current realities of politics and business. The abstract and the figurative merge, just as the artists’ individual personalities merge into the creative partnership, creating a visionary, spiritualized world reminiscent of the peaceable kingdom paintings of the nineteenth-century Quaker artist, Edward Hicks. The supposed conflict between beauty and seriousness in art that we take for granted nowadays is incorrect: art need not choose between being either eye candy, superficial or sublime, or politically correct propaganda, bitter, but good for you, or, that egregious synthesis of vapidity harnessed to pretentiousness. The art critic and philosopher Arthur Danto wrote, about what he calls our kalliphobia, our fear and hatred of beauty, as inherited from the Dadaists, disgusted by the hypocrisy and waste of the Great War. 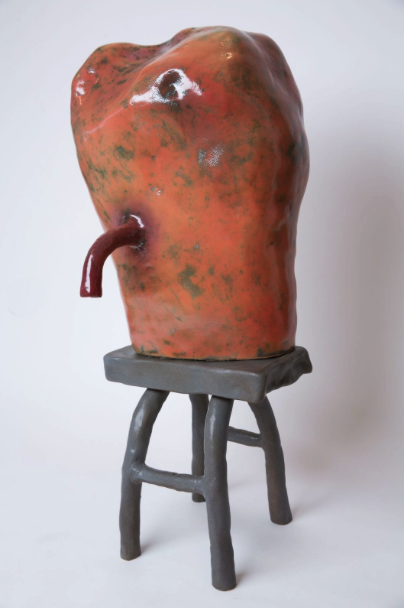 Unfortunately, the desire to shock and disgust, “to make people scream,”2 in Max Ernst’s words, has now become the established practice taught in art schools; it has been co-opted by the market. Davila and Lopez cite in their artist statement the ancient Greek term kalokagathos, or kalo k’agathos, “beautiful on the outside and noble on the inside.”3 Carried to extremes, it is a dubious equation, of course; the execution of the homely seventy-year-old gadfly, Socrates, by gym-toned Athenians (considered middle-aged at thirty) ought to make us wary of superficial judgments based on appearance. However, given the current enslavement of contemporary art to market forces, perhaps it is time to acknowledge again, with Keats, that truth can be beauty, and vice versa, and reconsider artworks like those created by that third person, /eE.l.os/, that function as beautiful and wise kaloi k’agathoi. Alt-Left: Local Heroes @ Berkeley Art Center. 1275 Walnut S. Reception May 29,. Artist talk May 20, 2:30pm. Show runs to June 17. Some critics and artists have argued “if it is political, it is not art,” while others stipulate that ‘if it is art, it is not political.” My contention is that not only can artists comment significantly on politics in their work, but political engagement in specific situations can produce authentic art. Artists have often served as cultural critics in the past, even, via satire, as moralists, in a bizarre way, and some continue to do so, even if people no longer look to art for education or moral edification. Paradoxically, artists employing traditional realism—creating windows into alternate or superior realities— most cogently point out the flawed unreal core of consensus reality…. [They] leaven their cultural critique with irony, imagination and humor, and exemplary craftsmanship. Through satire, they help us deal (square ourselves) with things as they are, illustrating what a long, strange trip it’s always been, as their spiritual predecessors Hieronymus Bosch and Pieter Bruegel knew only too well. Art professor and critic John Seed assembled this large group show with Santa Clara University art professor Kelly Detweiler. Below, the show/s premise, a celebration of the Bay Area Figurative painter David Park, whose commitment to self-expression through painting and depicting the everyday world —magically— make him an exemplary figure for painters today. Park’s daughter, Helen Park Bigelow, was on hand for the panel discussion, which included Seed, Detweiler, painter Jennifer Pochinski, and myself (summoned from taking pictures from the balcony). A graceful tribute to Park by painter Kyle Staver, who could not attend, began the discussion. Thirty-seven national and international artists’ work, a glorious new venue (with a new Linda Fleming painted steel sculpture outside and a Dale Chihuly glass sculpture inside), a comprehensive catalog (available online), support from the Sam Francis Foundation and Harry and Margaret Anderson, three cash prizes, and an enthusiastic reception — congratulations to all! 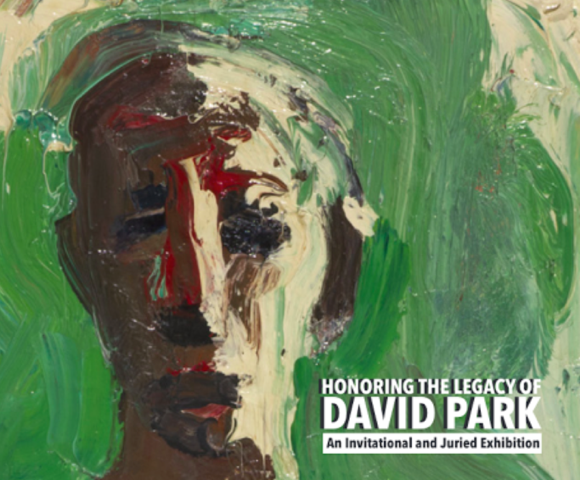 This exhibition is intended to pay homage to the art and values of artist David Park (1911-1960), the founder of the tradition of Bay Area Figurative painting. It does not include Park’s own works, but instead features the works of two invited artists and 35 artists chosen by a panel of four jurors. David Park’s figurative works are characterized by humanity, candor and bold painterly brushwork. The goal of the exhibition jurors was not to select art that mimics David Park’s style, but rather to select paintings that honor the legacy of Park’s artistic independence and integrity, and also his interest in painting people and places that held personal meanings for him. —John Seed is a professor of art and art history at Mt. San Jacinto College. He is also an arts writer and blogger whose writing has ap- peared in Harvard Magazine, Art Ltd. the HuffingtonPost and Hyperallergic. Seed wrote the catalog essay that accompanied the 2015 exhibition Interiors and Places': David Park, Richard Diebenkorn and Elmer Bischoff at Hackett Mill Gallery in San Francisco. —DeWitt Cheng is an artist, collector, freelance art writer, educator, and curator based in San Francisco. 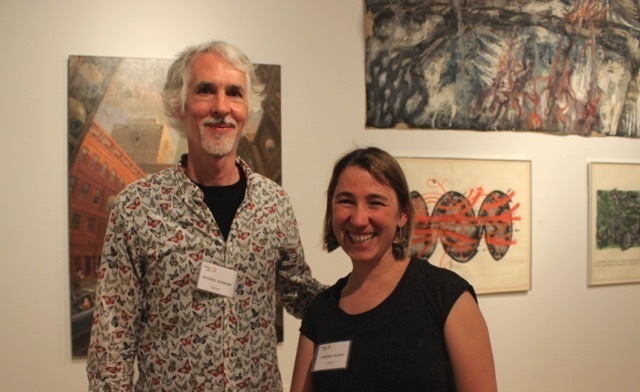 He has served as the director of Stanford Art Spaces and writes for numerous art publications including Art Ltd Magazine and Visual Art Source. —Andrea Pappas is an Associate Professor of Art History at Santa Clara University, specializing in American and Contemporary Art, Gender and Visual Arts. 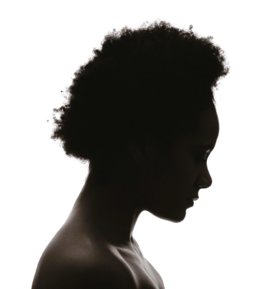 She holds a BA in Fine Arts from the University of California at Berkeley, and both an M.A. and PhD in Art History from the University of Southern California. —Jessica Phillips is the Director of Hackett|Mill Gallery, San Francisco, which represents the Estate of David Park. She holds a B.A. in English Literature and Art History and an M.A. in Contemporary Art from Sotheby’s Institute of Art, London.